Battery Isolators and Combiners are valuable pieces of equipment that are essential in battery systems where isolation or combination is required. A range of battery isolators and battery combiners from Victron Energy are available for online purchase at MPE-Online. There are many types available, including Diode Isolators, Diode Combiners, FET Isolators, Microprocessor Controlled Battery Combiners and Battery Combiner Kits. 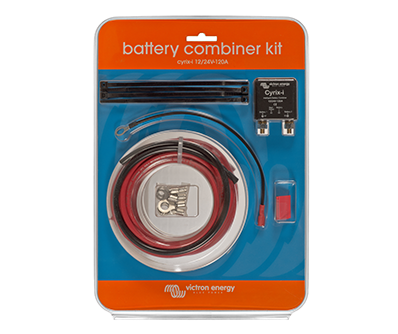 Battery Combiner Kits come ready packaged with the Cyrix Microprocessor Controlled battery combiner, cable and cable connections. The Cyrix Combiner is an intelligent and reliable device that allows connection of two or more batteries and is typically but not exclusively used in caravans, motor homes and mobile vehicle applications.